The 2016 ENnie Award nominations are out and we are honoured to share space with some damn fine products. 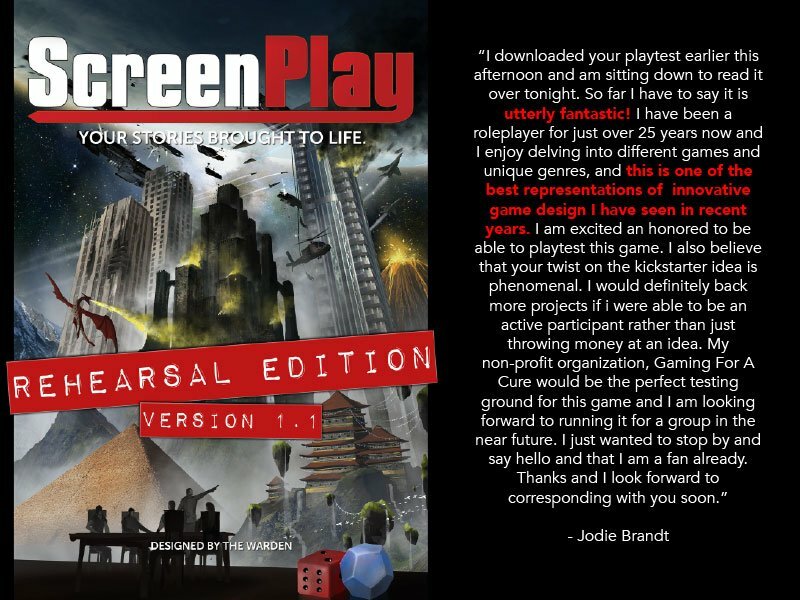 Earlier today, ScreenPlay: The Rehearsal Edition (a public playtest draft of the completed and now available ScreenPlay core rules) received a nomination for Best Free Game. And that means polls will be open from July 11th to the 21st. Huge thanks to the judges for this nomination and we look forward to figuring out how we’re going to be at the ENnies this year. It’s been a couple of weeks since anything for the ScreenPlay playtest has graced this page and it’s not because everything’s gone quiet. Far from the truth, the finishing touches are going into Version 1.4 of The Rehearsal Edition with hopes to release it by early next week to everyone who downloaded this free PDF from DriveThruRPG and RPGNow. 600+ downloads later and we’ve collected a fantastic group of avid playtesters are not only giving this game a run for their money, they’re creating new stories, settings, and genres to play. Playtest surveys are still rolling in with two additional unlocked treatments putting it at over 100 pages. The shining crown of this playtesting is the activity going on in the ScreenPlayers Guild, our online G+ community. Here’s a sample of the most recent discussions and events. Ironbound Play-By-Post: Already into its fourth scene, this rendition of ScreenPlay’s dark fantasy tale of witch hunters features Derya (the scout), Gareth (the blade), Drachen (the archanist), Philip (the shield bearer) and Lyonesse (their new commander). If you’re looking for an idea on what makes this game tick, be sure to check out the Ironbound PbP thread. Necronomicon Stories: Based on an idea created by one of our playtesters, we’re experimenting with a Lovecraftian tale of monstrous terror… in the future! The ball has only begun to bounce on this upcoming story and with only two Writers currently signed up, there could be room for a couple more. Escape From The X: The third treatment recently unlocked from playtest surveys, this sci/fi-horror story takes place in Mystical Throne Entertainment’s Mercenary Breed. The short and sweet of it: mercenaries hired to deliver an alien prisoner to a secret installation find themselves desperately outnumbered when someone mysterious releases every inmate to wreck havoc and spill as much blood as possible. Look for it in Version 1.4 next week! Optional Rules For Building Potentials: With many core mechanics locked down, some optional rules are being considered. Such as building your dice roll’s value based on the number of details you apply in a scene. Kickstarting It Up A Notch: Finally, we’re also looking at Kickstarter to help elevate the finished version of this project. With playtest surveys averaging a score of 4.6 out of 5 and ideas bouncing around for a small product line built using ScreenPlay, all options are on the table right now. This and more is taking place at the ScreenPlayers Guild. Join us and see what all the fuss is about before the cool kids see what we’re doing and want to make it a crowd. 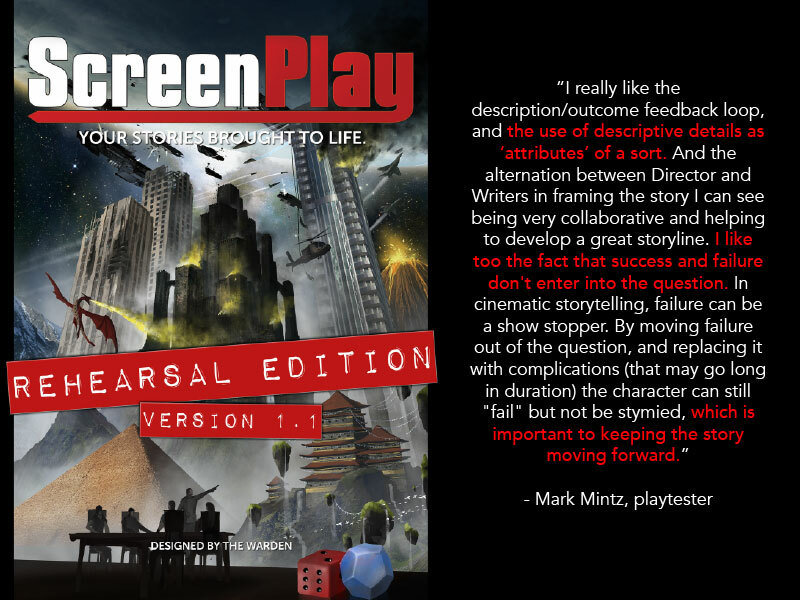 With almost 20 pages of new and updated rules, options, and a brand new treatment, Version 1.3 of ScreenPlay: The Rehearsal Edition is now available for download on DriveThruRPG and RPGNow. If you’ve already clicked on this free (that’s right, FREE!) playtest edition of the upcoming storytelling RPG, check your message to see what our awesome playtesters have helped up improve and expand upon. 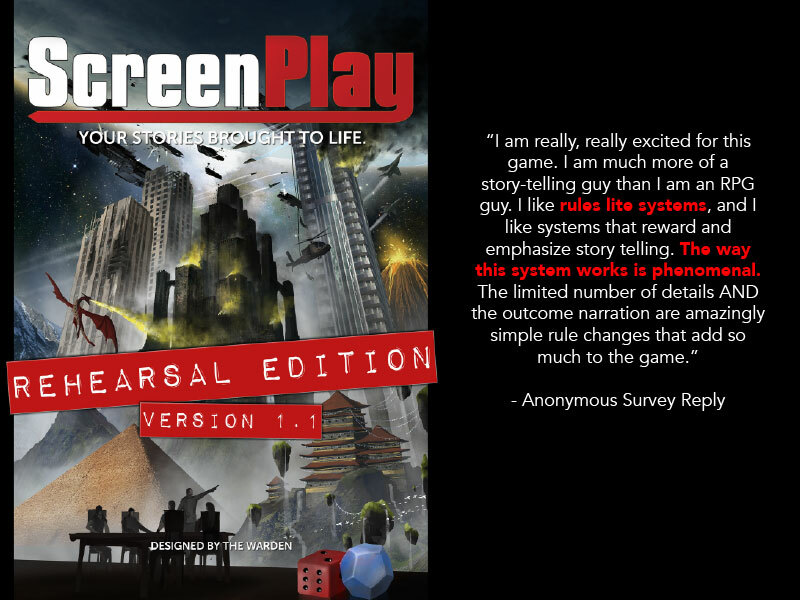 And if you’ve never heard of this ScreenPlay thing, you’ll want to click on this fancy blue text to read all about the game reviews and playtest surveys have awarded an average rating of 4.6 out of 5 stars. You say you want bullet points of all the new goodies available in ScreenPlay? Well, why didn’t you say so? New rules for adding motivations and hindrances to your characters. Adding motivations not only provides roleplaying incentives for your lead and supporting characters but also provides opportunity to earn more milestones (think of them as XP points) and hindrances are personality flaws and obstacles your characters must overcome during the course of the story… plus they’re opportunities the Director can use against your characters to make a scene more challenging. Creating advantages for your allies with step bonuses, maintain a description’s effects over multiple turns, and prepare/concentrate on a description to gain step bonuses. Refined rules and explanations on conflict rolls and complications making them easier than ever to understand and apply. A revised 2-page character sheet with room for additional in-game tables, notes for character roles, initiatives, even your own sketch of the character. New rules and guidelines for using super powers, perfect for the freshly unlocked treatment called Nightfall, a superhero tale exploring the concept of multiple people taking on the role of a single masked vigilante. The work is not done yet and the door is always open for more playtesters to join in the quest to make ScreenPlay better every day. Earn playtest points for free copies of the game, maybe even a print copy of the upcoming Director’s Cut of the game. Join the ScreenPlayer’s Guild community and enter in-depth conversations on various aspects of the mechanics or join in a play-by-post game. Help us make the game you want to play and create the stories you’ve always wanted to tell. What a brilliant, crazy week it has been! Our first week of playtesting for ScreenPlay has now moved into the second week and the results have been helpful, insightful, encouraging, and so much more. There’s a risk in throwing out something unfinished to the void and hoping that most of it will stick to the wall. So far, it seems those of you who have decided to help us out have really latched onto it. Here’s a brief bullet point update on what’s transpired over the past week. A lot of terrific comments have been shared on the same surveys, as well as some constructive feedback. On Tuesday, October 26th, Version 1.2 of the Rehearsal Edition was updated to everyone who has downloaded the original PDF on DriveThruRPG and RPGNow. The primary focus was a revised approach to Act Two: How To Play using a more traditional approach to mechanics presentation and character creation, along with some modifications to milestones and the additional of character hooks. The current number of playtest points awarded sits at 11 as of the time of this writing, meaning we’re only 4 more points away from unlocking Nightfall, a modern day superhero story of multiple people acting as a single superhero/vigilante. Page views to this site for October have tripled the previous highest month and the month isn’t even finished yet. On the ScreenPlayers Guild G+ Community, we’re getting ready to start a play-by-post rendition of Ironbound, the dark fantasy treatment provided in Version 1.1 of the playtest. If you have yet to join the community, feel free to join in. It’s a great opportunity to see the game in progress and laying down the foundations for how Directors and Writers can set up their own take on a story. Fifteen weeks remain and the wheels are turning faster than ever. Huge thanks goes out to everyone who has joined in the effort with more than just enthusiasm and has shown this tale is far from over. And remember to keep using the #ScreenPlayRPG hashtag to help get the word out and fill out those surveys to collect those playtest points. Now let’s close out this post with a trio of gracious comments from surveys completed this past week. 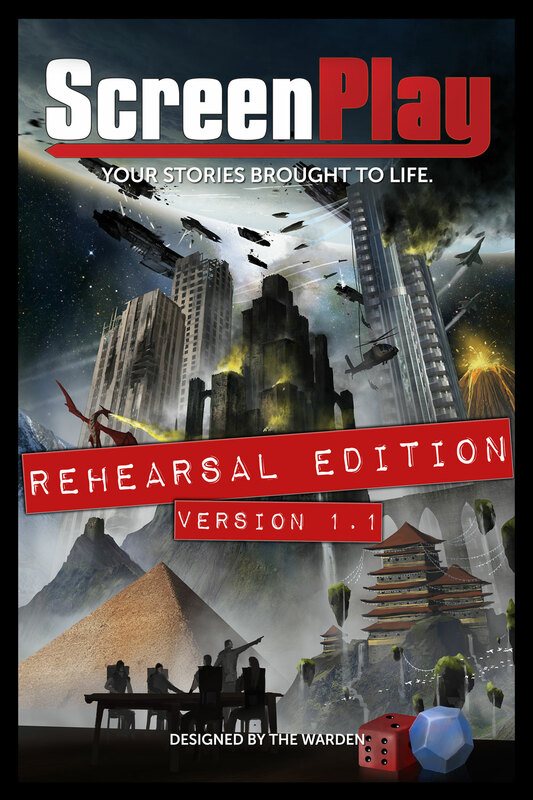 The cover for ScreenPlay: The Rehearsal Edition, by Jeff Brown. After two years of development and three months of writing, re-writing, and sweating, ScreenPlay: The Rehearsal Edition [will be] available for free on DriveThruRPG and RPGNow. Aside from putting the first draft of this unique, public playtest edition of our upcoming storytelling RPG, you can also learn everything about the game in our new and expanded ScreenPlay pages. Finally, explore the dark secrets of Ironbound, the first treatment for ScreenPlay where the Writers take on the role of these elite witch hunters tasked with protecting the kingdom of Alduire from all forms of magick and rituals. The time is here, so starting click, start reading and start writing your next story with ScreenPlay.